TV Trivia Q1. What famous female movie star got her start on the very first episode of primetime TV series Peyton Place, which ran from 1964-1969? TV Trivia Q2. Which Peyton Place actor/charactor, also served as the Peyton Place narrator at the beginning of every episode from 1964-1969? Below, the cast of Peyton Place circa 1968, clockwise from left: Ryan O'Neal, Christopher Connelly, Robert Hogan, Percy Rodrigues, James Douglas, Dorothy Malone, Ed Nelson, Tippy Walker, John Findlater, Diana Hyland, Patricia Morrow, and Barbara Parkins. Peyton Place (1957), a feature film set in pre-World War II New England. Peyton Place the movie starred Lana Turner as Constance MacKenzie, Lee Philips as Michael Rossi, Diane Varsi as Allison MacKenzie, Russ Tamblyn as Norman Page, Terry Moore as Betty Anderson, Hope Lange (The Ghost and Mrs. Muir) as Selena Cross, David Nelson as Ted Carter, Barry Coe as Rodney Harrington, and Lorne Greene (Bonanza) played a lawyer. Return to Peyton Place (1961), a feature film sequel based on Grace Metalious's novel sequel of the same name. Return to Peyton Place starred Carol Lynley as grown-up author Allison MacKenzie, Eleanor Parker as her mother Connie Rossi, Robert Sterling as Mike Rossi, Jeff Chandler as Lewis Jackman, Mary Astor as Roberta Carter, Brett Halsey as Ted Carter, and Tuesday Weld as Selena. The official 20th Century Fox trailer for Return to Peyton Place (below) features much of the movie's cast. The cast for Peyton Place the TV show consisted of different actors than the preceding movies, although some of the plot points were similar. When Peyton Place the primetime series began in 1964, the character of Dr. Michael Rossi (Ed Nelson) was setting up his new medical practice in town. Shop owner Constance MacKenzie (Dorothy Malone) disapproved of her daughter Allison MacKenzie's (Mia Farrow) budding romance with older Rodney Harrington (Ryan O'Neal). Rodney's girlfriend Betty Anderson (Barbara Parkins) discovers she's pregnant after Rodney breaks up with her. Norman Harrington (Christopher Connelly) is Rodney's shy younger brother and Allison's friend from school. Allison's biological father Elliot Carson (Tim O'Connor) is sprung from 18 years in jail for murdering his wife and arrives in Peyton Place; he's soon shot and survives to have his name cleared by a confession. That doesn't even get you all the way through the first season of Peyton Place, which became addictive, must-see television for baby boomers and their parents, and was soon airing 3 nights a week. 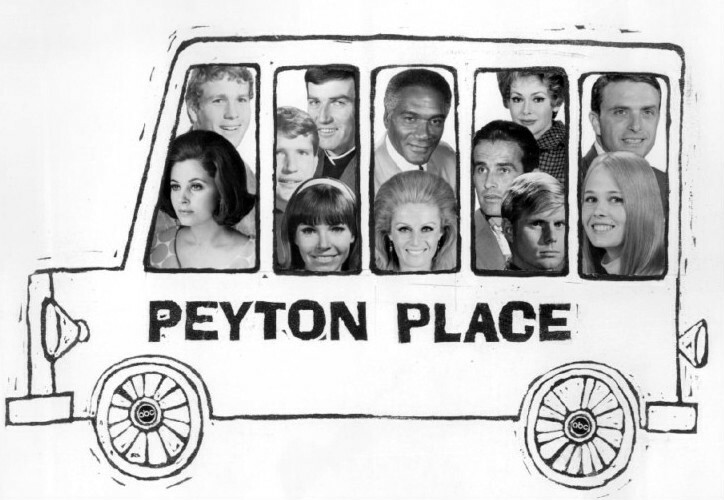 Over 200 actors appeared on Peyton Place during the four years it was on the air. Familiar faces for baby boomer movie-going and television viewers included Mariette Hartley (Claire Morton), Lee Grant (Stella Chernak), Barbara Rush (Marsha Russell), Leslie Nielsen (Vincent/Kenneth Markham), Joan Blackman (Marian Fowler), Gena Rowlands (Adrienne Van Leyden), and Richard Dreyfuss, who had two small parts in a couple of episodes. Actress Lee Grant won an Emmy Award for her Supporting Actress performances in Peyton Place. Return to Peyton Place (1972-1974), an NBC daytime soap opera. Return to Peyton Place was a quasi-sequel to Peyton Place, minus most of the original cast members and storylines from the original television series. Murder in Peyton Place (1977), a TV "reunion" movie with the original Peyton Place TV series cast members (Dorothy Malone, Ed Nelson, Tim O'Connor, Christopher Connelly) focused on the "deaths" of Allison MacKenzie and Rodney Harrington. Peyton Place: The Next Generation (1985), a TV movie that picked up the story of Allison MacKenzie, who had disappeared 20 years earlier. More familiar faces returned for Peyton Place: The Next Generation, including Dorothy Malone (Constance Carson); Ed Nelson (Dr. Michael Rossi); Tim O'Connor (Elliot Carson); Barbara Parkins (Betty Harrington Cord); Christopher Connelly (Norman Harrington); and Pat Morrow (Rita Harrington). Ed Nelson, who played Dr. Michael Rossi on the original Peyton Place TV series and in the two sequel TV movies, was already a veteran character actor on film by the time the series started in 1964. After Peyton Place went off the air, he continued his prolific acting career, guest-starring on other TV series like Banacek, Cannon, Marcus Welby, M.D., Mod Squad, Mission: Impossible, The F.B.I., Charlie's Angels, Trapper John, M.D., Murder, She Wrote, and many others. His last appearance onscreen was as George Dressler in the feature film Runaway Jury (2003), with Gene Hackman, John Cusack, Dustin Hoffman, Rachel Weisz, and Bruce Davison. Septuagenarian senior citizen Ed Nelson returned to university in 1999 and completed his undergrad degree at the age of 71 in 2000. He was married to his wife Patsy (nee Miller) from 1950 until his death as an octogenarian senior citizen in August 2014 at the age of 85, from congestive heart failure. Ed Nelson's wife, 6 children and many grandchildren mourned his passing, as did his baby boomer fans. TV Trivia A1. The very first episode of Peyton Place aired in Sept 1964, and was actress Mia Farrow's 1st credited onscreen role, and her first-ever role on television. Mia Farrow had previously appeared as an uncredited extra in the movie John Paul Jones (1959). Farrow's second movie Guns at Batasi (1964) was her first credited movie role, was released the month after Peyton Place began airing. Mia Farrow was written out of Peyton Place in mid-1966 at the request of Farrow and her then-husband Frank Sinatra. TV Trivia A2. Radio, stage, movie (Blackboard Jungle, The Caine Mutiny) and television actor Warner Anderson, who played newspaper publisher Matthew Swain on Peyton Place, was also the series narrator. 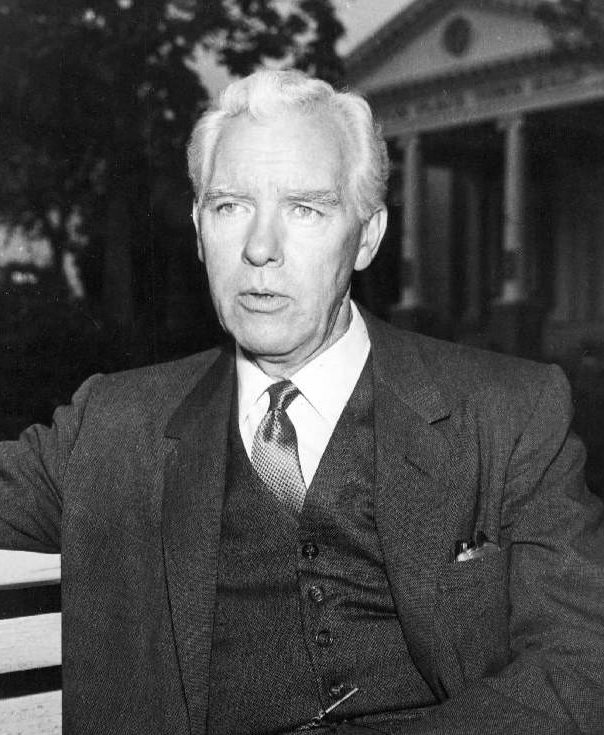 Although his character of Matthew Swain was written out after the first season, Warner Anderson continued as the Peyton Place narrator until the series went off the air in 1969. Warner Anderson had begun his career as a child actor in 1915 in the era of silent movies. He was a senior citizen when he died in August 1976 at the age of 65, leaving behind his wife Leeta Anderson and a son.